Well this was a doozy of a weekend! All week, the local news hyped up this crazy ice storm that was supposed to hit us. They claimed it would be worse than this epic storm that came through 10 years ago. Needless to say, it instilled fear in just about everyone. Schools and businesses started to make the call on Thursday evening to close on Friday. I get it. It's better to be safe than sorry. I also get that weather is so unpredictable. While certain parts of the city got it worse than others, our suburb really didn't get hit with much. I think we are too far north. We didn't treat our sidewalks or driveways, and the surfaces were completely walkable. I'm not sure if I'm relieved or annoyed that it was way overhyped. I was scheduled to take the beagle out to the veterinary referral clinic Friday morning at 8am. She needs an ultrasound (long story). It's hard to get an appointment there, and it's an hour drive each way. I had set up my Friday so that it would work my schedule, but in light of the storm, I had to push it off until a random time this Wednesday. Boo. Oh well, like I said, better safe than sorry! We are also in the process of selling my Saturn Vue and finding renters for our rental property. Adulting is HARD. Having the city completely shut down complicated our ability to meet up with the people interested in seeing the house and the car. Let's just say that we had high hopes of having a productive weekend and it ended up being the opposite. Sometimes life forces you to slow down, and I welcome any opportunity I can take a nap! So, for that I am thankful! Ok, now let's talk about this flannel cardigan! It's so clever! I love that it has the collar like a typical flannel button up, but it has a cascaded, flyaway front like an open cardigan. Because of its collar, I had the idea to wear my favorite military vest over it and cinch the silhouette with a leather belt. I intended to wear this over a dress, but I decided to go with some winter white skinnies for a little more warmth. 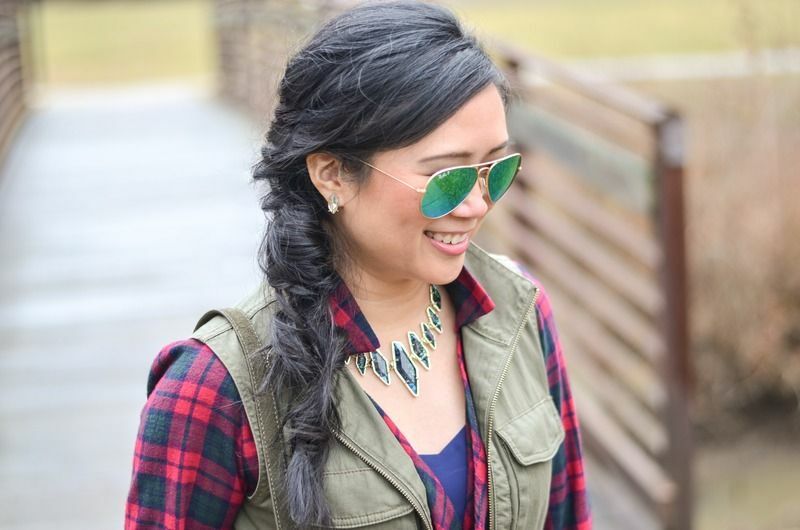 I am obsessed with how well this necklace finished off the look! Obsessed!! The last time I wore this cardigan was for a holiday party. Plaid and stripes go so well together, so that was a natural pairing. These leggings are actually a dark green color, though they look black in the photo. I thought I would re-post that selfie so you could see both looks next to each other. It will be so cute with a tank, ripped shorts, and some Chucks in the warmer months! Now if someone could tell the ice to go away so spring could get a head start, that would be great!! Oh that cardi is beautiful! :) And while inconvenient, much better to have missed the worst of the bad weather. We had a big storm here just yesterday and hubby was upset we didn't get much of it - lots of people lost power and phones after it so I was just glad we weren't badly affected! oh boy adulting is hard. This flannel cardi really is the cutest, love it! 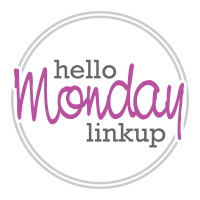 Sometimes it's nice to be able to take a break, but sometimes you know all of your 'to-do' list is just going to get pushed back to another weekend! I hope you are able to get it all done and I am glad the ice storm wasn't too bad for you! What a great way to make a cardigan more versatile---at first I just thought it was a shirt!! Sorry about the adulting---you seem to be taking it all in stride though and I think that's the secret!! That is frustrating that you had to move so many appointments around...and then have it all be for nothing! Oh well. Love that you share both ways you wore this flannel. You're so good at making it look like a completely different piece in each outfit! Loving that plaid cardigan! 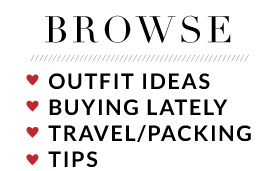 Looks like you could wear it in so many different ways. 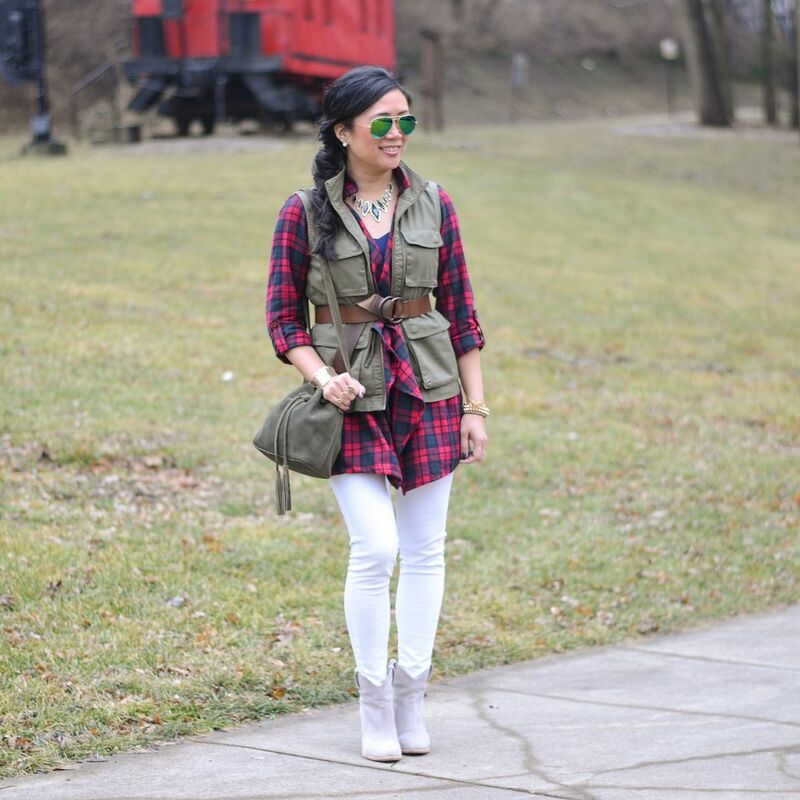 Love the way you styled it with the military vest and white jeans. So stylish :) Thanks for hosting! I've never seen a flannel cardigan before, that's really neat. 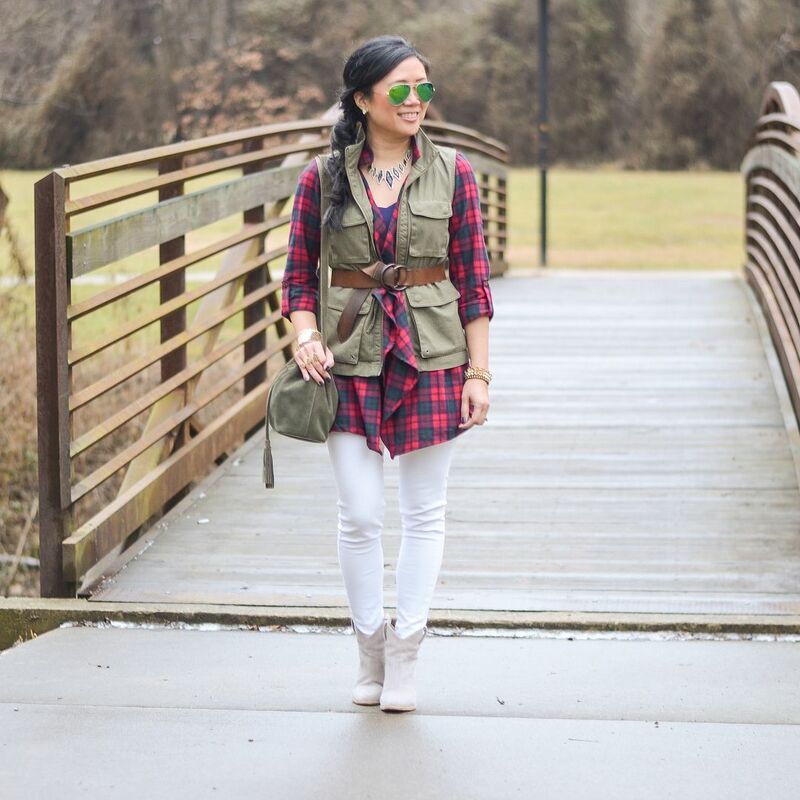 Love it paired with the vest and booties. Totally obsessed! I love how you've pieced this together to look completely amazing! 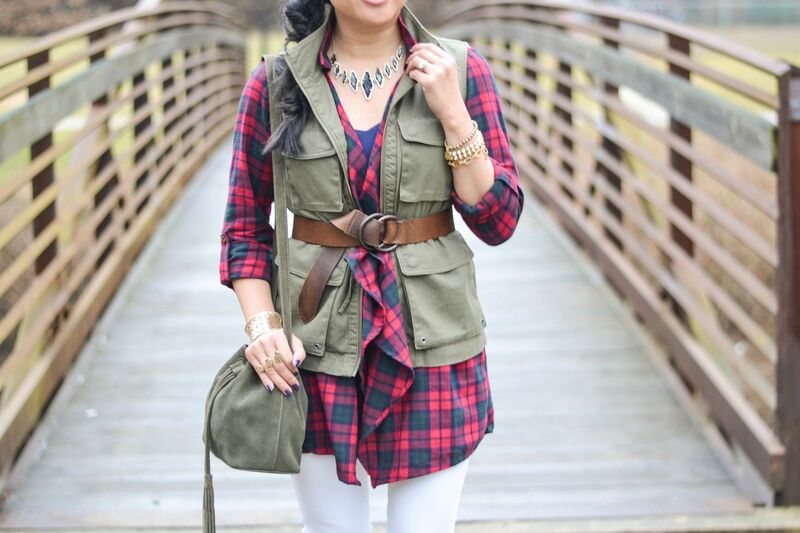 The military vest looks great over the plaid cardigan, and that necklace is a beauty! Love how you styled this flannel cardi for a different and versatile look. 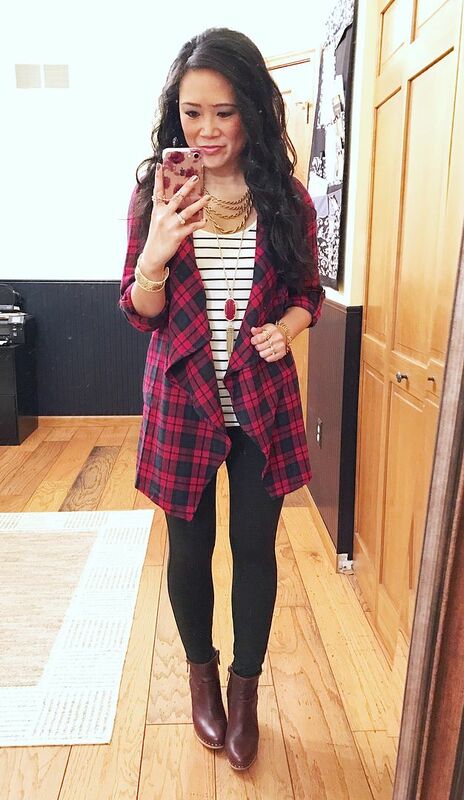 Cutest flannel cardigan! I love seeing it styled both ways. Those booties are the cutest! 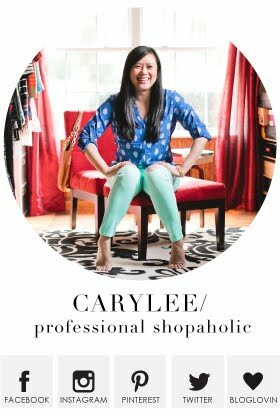 You're a layering pro, girlfriend!